Pink Shoes: Thankful for now. We're moving my grandma into an "independent" living facility over the course of the next few weeks--and really--my mom's doing the majority of the work. And it's a lot of work on top of a lot of emotions. And when I look around the little apartment she'll be moving into next weekend, after all of her carefully selected furniture and pictures and mementos are put into place to try and replicate a feeling of home it makes me so thankful for the things I have right now, in my own home. And it makes me want to really soak in those little moments--the ones that are fleeting--the ones that are right in the middle of a frustrating day perhaps--the ones that are easy to take for granted--the ones that seem........forgettable......but shouldn't be. 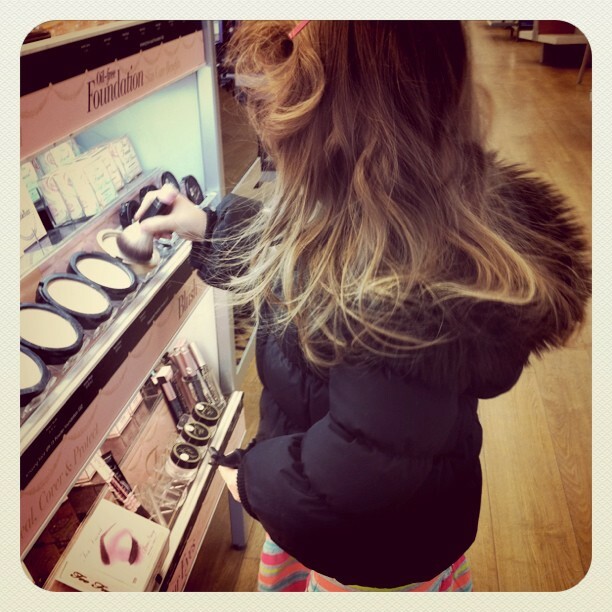 A little girl who knows the proper way to swirl her powder brush through a compact..........and a little girl who loves life and wants to do everything I do. 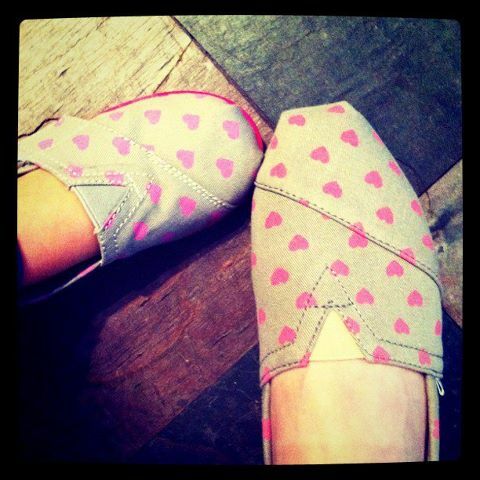 Mommy & G matching Toms. I love this picture. I truly do. 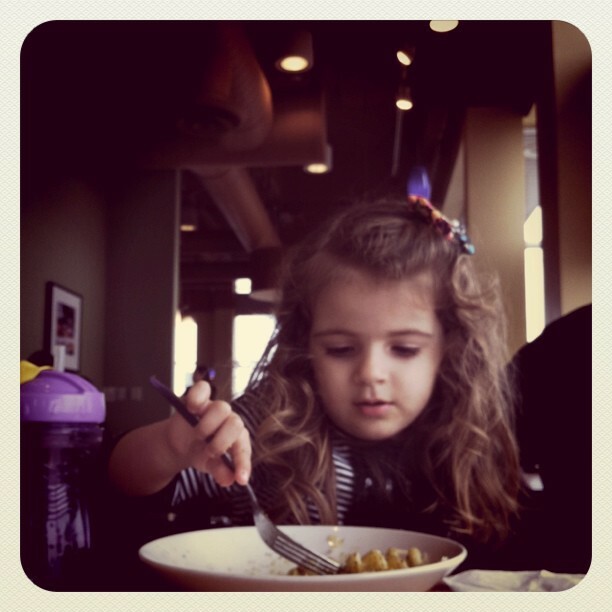 Eating lunch at Noodles & Company with Georgia. She can put away a bowl of pesto cavatappi like no ones business. And every time she does she says, "I'm so 'cited to eat pesto. I love you mommy." 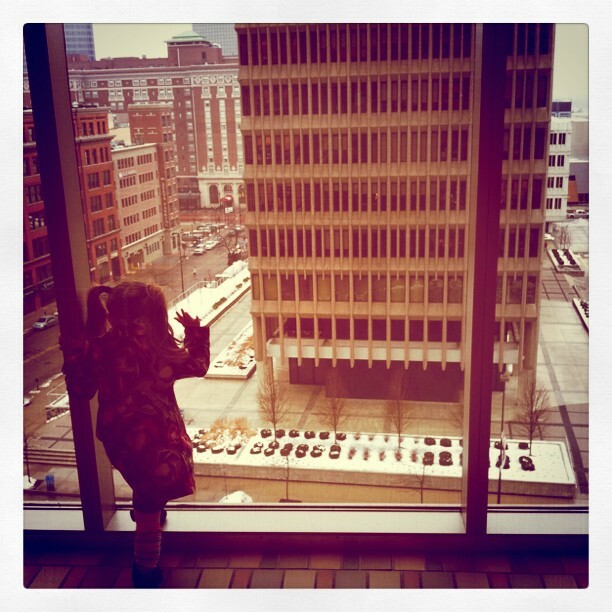 A brave little girl who smashed her body as close to this 10th story window as she could get. She told me it'd be fun to fly. It's that loving life thing--she's got it mastered. Crazy lights. I will remember crazy lights for the rest of my life. I hope we do it until Georgia is eighteen years old. 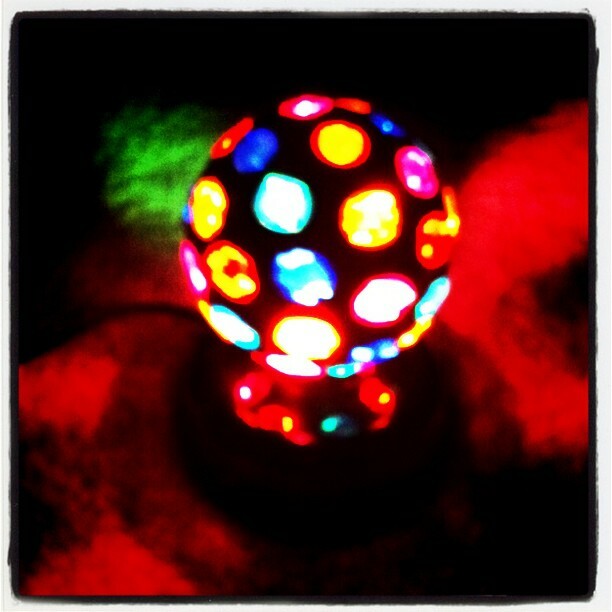 There is nothing greater than flipping on this disco ball before bed and having a little dance session as a family. Walrus's. This is Georgia's go-to move when she thinks we need a comic break. 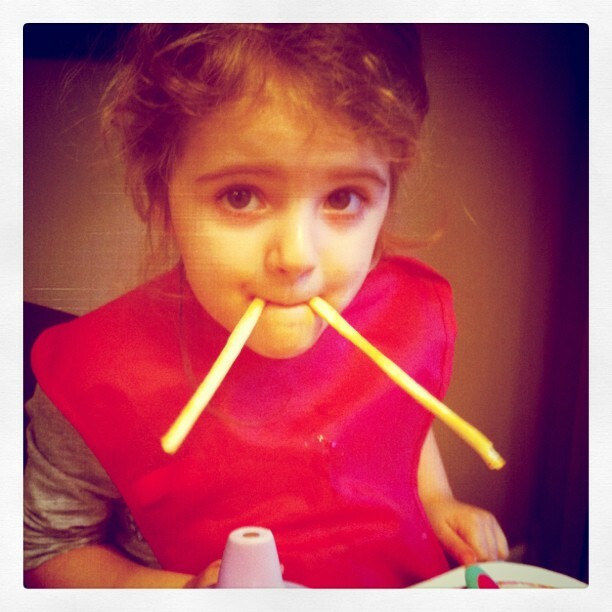 She can make walrus tusks out of just about anything. And she's pretty sneaky about slipping in her tusks without us seeing her and whipping her head around and announcing, "The walrus." Quiet-time. Naps are really over for us so we do about an hour and a half of quiet time every day. 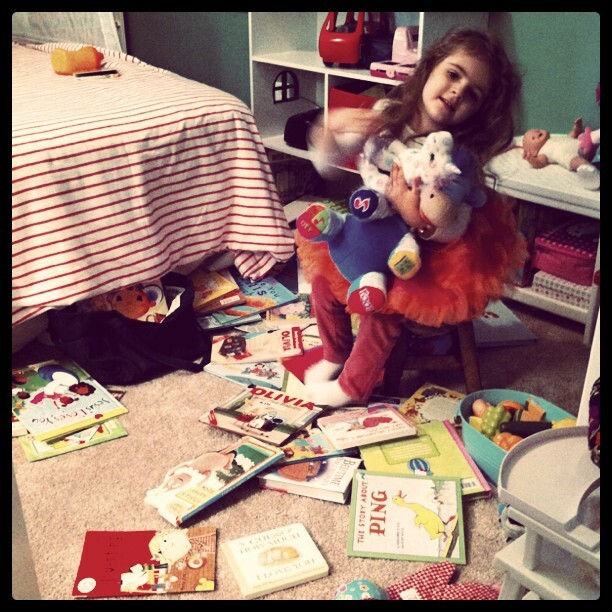 I generally walk into an avalanche of books and toys and babies and animals. It's still adorable. I'm thinking one day I'll be over every toy on her floor. 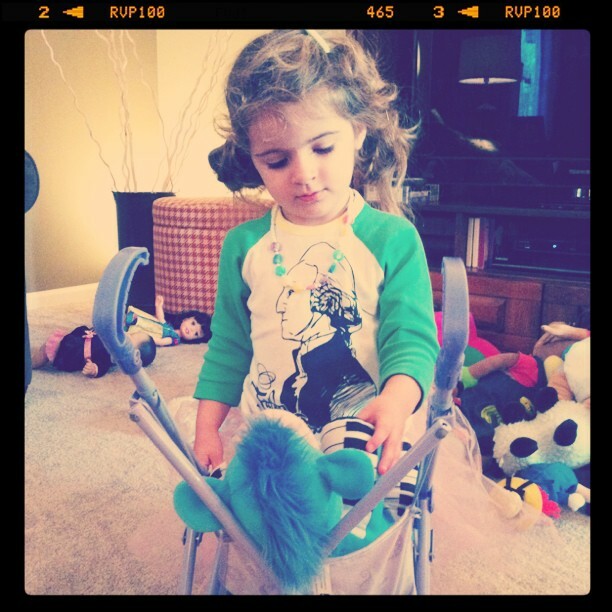 A little girl who wants to wear her George Washington shirt with a pink tutu. And you better believe when I ask her who's on her shirt she can tell you, "Our first resident." That's right, resident. Not president. Aunt Enna, who can get Georgia to sit still long enough to paint pink sparkly nails. Nothing cuter than little painted toddler nails. What's that little thing that you're thankful for? 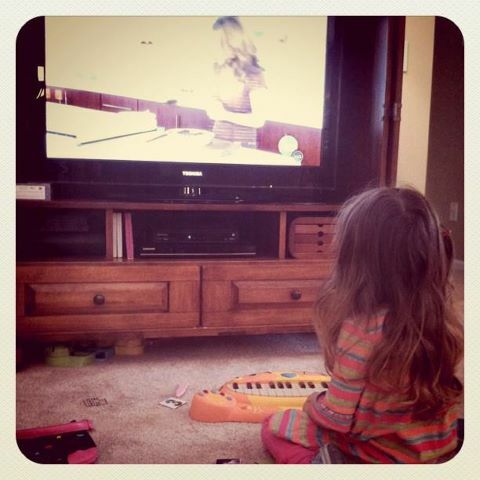 I love your blog...found it through Kelle Hampton's. I thought my 3-year-old was the only kid who loved George Washington. Her shirt is adorable. Where did you get it? Or is it one of a kind. Oops, that just posted with my husband's google acct. Alyssa--It's from a great little online store called Okllo. They have lots of cool American Hero shirts! We have George Washington, Harriet Tubman, and Sakakawea. We're addicted! Thank you! I'm ordering one tonight. Your family is beautiful! Mom guilt. Stop ignoring it.